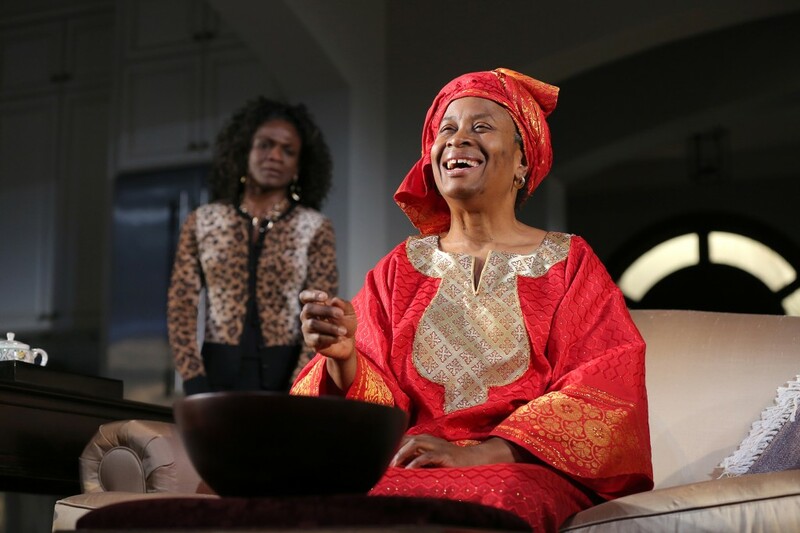 Kimberly Scott (foreground) with Patrice Johnson Chevannes and Kimberly Scott in Familiar at the Yale Rep. Photo by Joan Marcus. I reviewed Danai Gurira’s Familiar for the New Haven Independent, here. I was struck by how unabashedly old-fashioned the show’s first act is, and even compared it to You Can’t Take It With You. Here’s another thing, unrelated, that struck me and seemed too insidery for the review: For a show with four youthful (20- or 30something) characters and lots of creative design opportunities (a multi-room contemporary set, a suburban Minnesota winter blustering outside, mood lighting galore), there are hardly any Yale School of Drama students involved. It’s not like the show is a co-production with another regional theater, or so star-studded that certain reliable professional talent is summoned, or a certain stable of collaborators is automatically attached. Familiar’s world premiere production is a result of Yale’s Binger Center for New Theatre, the well-funded development program for new works and emerging artists. A number of Binger Center projects have had heavy Yale School of Drama student involvement: Last season’s These Paper Bullets had four YSD acting students in its cast, while the Rep show just before this one, Branden Jacobs-Jenkins’ War, had its sets, costumes and projections designed by students. As for non-Bingers, the much ballyhooed Streetcar Named Desire last year starring that werewolf from TV had YSD students as set designer, costume designer, sound designer/composer and dramaturg, and this year’s Arcadia did it a few better by having all those things plus the lighting designer and three cast members. By comparison, YSD alumni abound. Kimberly Scott, whom I remember seeing in some wonderful student shows back in the late ‘80s, not to mention in the original Broadway run of Joe Turner’s Come and Gone, has only done one Rep show (the black Death of a Salesman in 2009) since graduating in 1987. Director Rebecca Taichman has returned numerous times since graduating from the directing program in 2000; she’s responsible for the astounding productions of two David Adjmi plays, The Evildoers and Marie Antoinette. Dramaturg Carrie Hughes and scenic designer Matt Saunders are also YSD alums, while dialect and vocal coach Beth McGuire is an adjunct professor at the school. Don’t think of Familiar’s lack of student input as a complaint, and especially not as a compliment. It’s not even an aberration. This is the part of the year when lots of student projects happen (or have just happened), such as the directing theses. But it is too bad that more young creative types couldn’t have been a part of such a challenging and interesting play as Familiar, which takes familiar forms but couldn’t possibly accomplish its artistic goals without bold new ideas. Let’s hope some college theater programs take a crack at this intigriguing sociopolitical melodrama. Some more young blood would only help, and it’s a play that deserves a lot more productions. Betty & Veronica, or Beatrice and Viola? Copyright © 2019 New Haven Theater Jerk. Powered by WordPress and Stargazer.